Note: Dredd is offered in a 3D version as well. As I feel that format (1) actually makes things look worse and (2) solely exists to charge $4 more for the very same film, I watched this in the clearer, brighter, and less expensive 2D. Dredd is a character featured in British science-fiction oriented 2000 AD comics. He has made it to the big screen once before in a 1995 movie starring Sylvester Stallone. Based on that less than successful adaptation, my expectations weren’t particularly high for this. What a nice surprise that this is an entertaining improvement. Don’t get me wrong, it’s not going to win any storytelling awards. The whole thing plays out like an amalgamation of RoboCop Meets The Raid with a little Mad Max thrown in for good measure. But if you’re looking for a potent summer action flick (foolishly released in the fall) this should fit the bill. In the future, the United States has become an ever expanding wasteland. People live in housing blocks that have become slums blighted by crime. The Judges are a new type of law enforcement that serve as judge, jury and executioner all in one. Judge Dredd is our hero and Judge Cassandra Anderson is his fledgling sidekick with psychic abilities. Hooligans driving recklessly down the street lead the pair to the Peach Trees housing block. The 200-story slum tower is run by a murderous drug lord called Ma-Ma. She is the sole supplier of Slo-Mo, an addictive new narcotic that hinders the user’s sense of time. Now Dredd and Anderson must infiltrate her drug den and take down Ma-Ma and her ruthless network of thugs within the building. Dredd is an eye-popping combat film that is a violent pulp tale of mayhem. Actor Karl Urban strikes just the right balance as our lead. He’s all business as a no-nonsense superhero that gets the job done without ever cracking wise. He’s a poker-faced protector that never shows his face. Ok granted we do see his chin at least protruding from a helmet that covers his head. Actress Lena Headey as Ma-Ma is a bit harder to accept. She reads more like the grande dame on a prime time soap opera than the criminal kingpin she portrays here. Thankfully Olivia Thirlby gives us a reason to care in the engaging emotional arc her rookie Judge must undergo. The script conveniently involves a mind altering substance, called Slo-Mo, which gives the director free reign to slow down action sequences whenever the users are hyped up on the product. It effectively slows perception down and renders everything as if the air has been bedazzled with sparkles. Their production design of the future oddly gave me nostalgia for the late 80s sci-fi TV series Max Headroom. Some scenes almost looks as if they’ve been artificially colorized. The effects are kind of cheap, but if you’re a fan of shoot–’em–ups you’ll get your money’s worth. The violence supports an oppressively dreary tone. Its R rating is well deserved, but it’s highly stylized and artificial as befitting its comic book roots. Yes, we’ve seen this all before, but if it ain’t broke, don’t fix it I guess. This entry was posted on September 21, 2012 at 9:00 pm and is filed under Action, Science Fiction, Superhero with tags 2012. You can follow any responses to this entry through the RSS 2.0 feed. You can leave a response, or trackback from your own site. 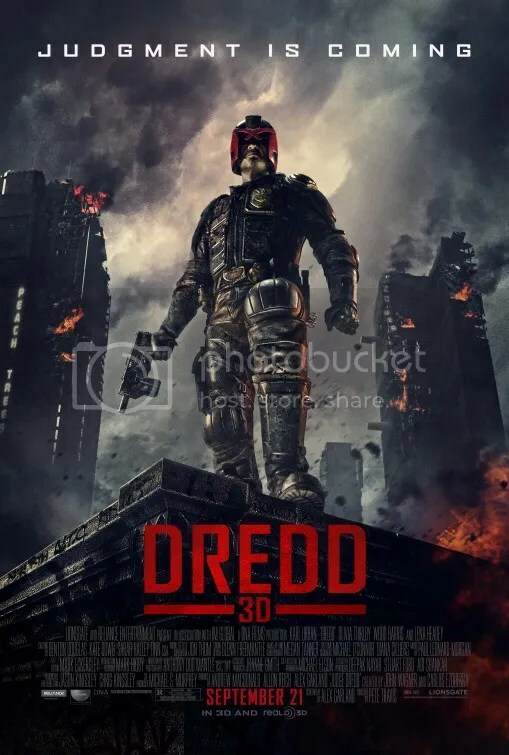 Good review, its a shame that the final nail has been put in Dredd’s Coffin with it’s terrible opening weekend at the box office. I’d have liked to see what they could have one with a sequel, but that’s the way the world works I guess. When it comes down to it Dredd is just a hard character to sell, with his obscured face, limited personality, etc. You’re so right. Mainstream audiences (at least in the U.S.) just aren’t taken with this character. Here’s a film that did the source material justice and people still shunned it. After just seeing The Raid: Redemption, this was almost the same movie. I enjoyed it. It kept me entertained, but ill soon forget all about it. The setting was remarkably the same – an apartment block on lockdown, but the story felt different. Dredd actually had a story. The Raid? Not so much. ah, maybe it was £33m not $33m that i read, shame. Great review, Mark. Looking forward to watching this one. It’s been surprisingly well-received. Perhaps people still had bad memories of 1995’s Judge Dredd on the mind. This exceeded expectations. maybe we’ll see it do the rare thing of going up in next week’s box office as word of mouth spreads? Hey, I can dream. Great Review as always Mark! I’m so gutted this didn’t do better at the box office, I can’t even blame the Americans because we didn’t flock to cinema here to watch it either! It went no higher than number 5 at our box office and is already out of the top 5 after 2 weeks! Question: Were you at all familiar with the source material? I was aware of the 1995 film adaptation Judge Dredd but not with the comic book. The sad thing is, as big a bomb as the Sylvester Stallone film was, it still managed to earn $12 million in its opening weekend. That was at ticket prices from almost 2 decades ago! Good review Mark. It’s fun, that’s for damn sure, but there was a bigger deal of action that was missing somewhere. I guess I just wanted more blood and guts and maybe that’s my fault, but still. It’s what I wanted! It’s what I needed! More blood and guts? Check out 2000’s Battle Royale. just letting you know that i’ve listed you to join in a brief questionnaire at my blog. its part of the “childrens-games-for-the-digital-age” activity that was recently passed on to me. please feel free to answer at your convenience at any time, and if you are unable to participate i will understand as there is no pressure. nice review Mark. am a bit let down that its a combat film, and that it draws comparisons to the Raid, being set mostly in a building. The Stallone movie was a bit different if i recall. but will still be looking forward to this because its science fiction and you gave it at least 3 stars. It’s better than I thought it would be and far exceeds the 1995 Stallone film. This looks like an interesting film. It’s acceptable sci-fi. I’d recommend watching Looper first now that it’s out. This movie really took me by surprise. No, it’s not high art… but it is far from bad. Talk about exceeding expectations! Ha-ha! I know what you mean. I didn’t expect much either. Nice surprise. Really interesting you got to see it in 2D, it was only released in 3D over here (one of my favourite anti-3D film journalists enjoys pointing this out a little too much!). I loved the look of it, but thought it was a little too violent for me. Violence never used to bother me, perhaps a sign that I’m getting old! The violence is pretty intense. I’d avoid Seven Psychopaths. It’s much worse.